Anyone remember those "Bizarro" stories in the Superman comic books? They took place in a kind of parallel universe where unexplainable happenings were the norm and a weird sort of skewed reality prevailed. Now what if there were such places in our own experience? Certain remote corners of the exhibition stratosphere that somehow defied every rule of sanity and logic --- where showmen dreamed of the unimaginable and somehow made it happen? Well, I think they got a dose of it in April 1964 at Inglewood, California's Century Drive-In. The first Bizarro Cinerama Outdoor Screening. Just imagine yourself parked comfortably among 1,100 vehicles, quietly enjoying your first corn dog of the evening. First you hear rumblings of that enormous "mobile" projection system behind you (how would they have gotten such a monster parked? ), and suddenly, there are three criss-crossing beams of light in would-be perfect synchronization (love to know if they were able to maintain that for even one show). You’re watching a picture that is 180 feet wide --- that’s going way beyond the scope of the windshield, let alone your peripheral vision --- and the thing’s 62 and a half feet high! Better just sit on the hood for this show --- or drive four miles or whatever back home and watch it from your front porch. I'd imagine passing truckers were alarmed. They must have felt like James Bond when Oddjob set up that big mirror in front of his speeding Aston-Martin. 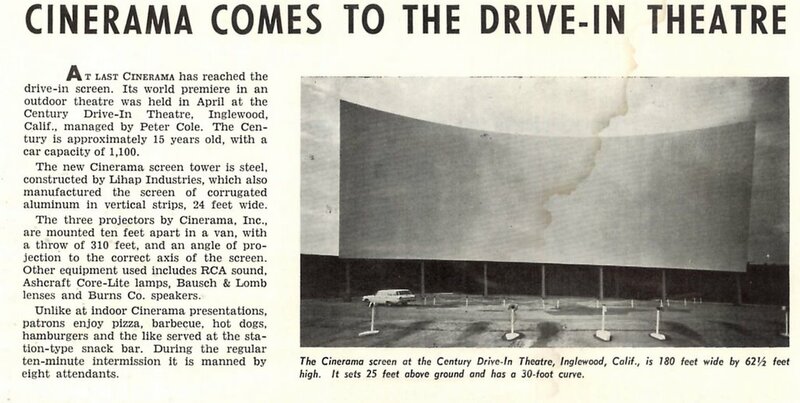 Wonder if drive-in Cinerama caused any pile-ups on the road? And what about five or so weeks from now when the fad’s over and they’re back showing Reptilicus, Hound Dog Man, and the like? Those are going to look mighty punk on that gigantic screen. I’ll bet that massive edifice was thoroughly stained with remnants of hurled popcorn, soda, and yes, corn dogs, by the time they finally gave up and took it down (assuming a stiff wind hadn’t already done the job for them). But what a crazy, magnificent spectacle in the annals of showmanship! It would be great to hear from someone who was actually there. Maybe they could tell us how long it lasted. Do you suppose there might still be structural remnants of that long-darkened screen still standing on some lonely, vacant spot out there in Inglewood, California? I’d like to think so. Just one little bizarro trace of a vanished moment we’d give anything to have experienced. 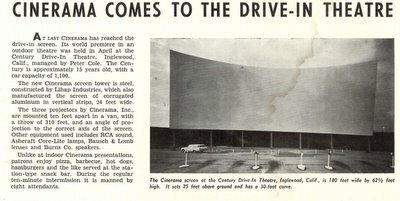 I remember going to the drive-in as a child and it was great, although we never had anything as good as a Cinerama Outdoor Screen. 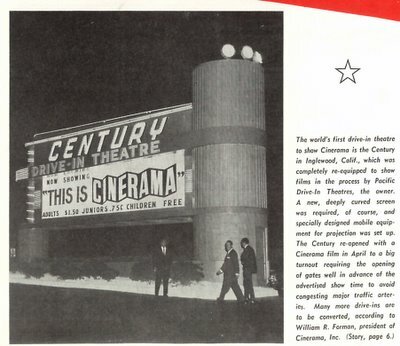 I can imagine that you would have to choose your parking space very carefully in order to appreciate the amazement that was Cinerama. I just love the technicolour snack bar all those bright colours, they just don't do snack bars that like anymore, I wish we could see a colour picture of it. Keep up all the great work. Remember when someone reissued "This Is Cinerama" but it was shown on ordinary movie screens? What were they thinking? I remember as a kid seeing "2001: A Space Odessey" in Cinerama (though not, alas, at a drive-in). 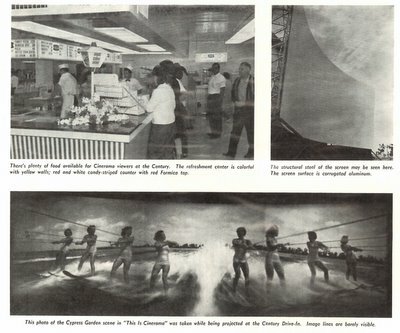 I had the idea at the time that Cinerama was invented just so they could show that particular movie, and I could never believe that it could be projected in any other form. It would seem weird to me even today to see it on the teeny little box of a TV set! I guess that big Cinerama screen really does create an impression.